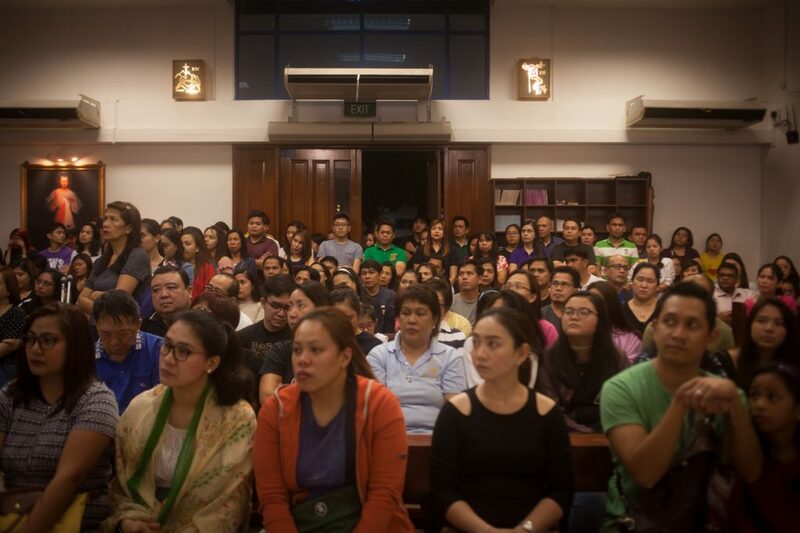 Listening attentively this Wednesday evening at the Cathedral of the Good Shepherd are over a thousand Filipinos, the vast majority of whom are professionals coming straight from work. The church is full to its brim; people stand outside the doors, peeking in. 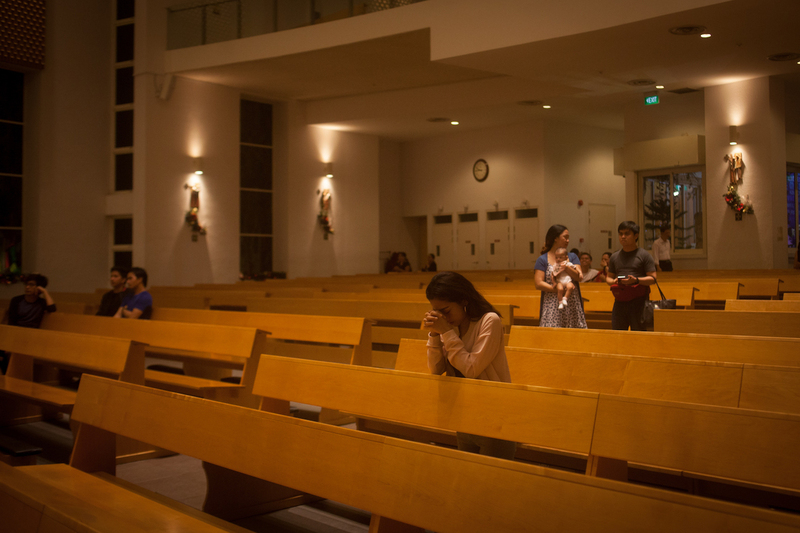 The first night of Simbang Gabi, held at Church of the Divine Mercy. Signalling the start of the mass, attendees stand as altar boys walk in towards the pulpit. St Anne’s Church was filled to the brim, with the doors barely closing behind them. They have come to attend the fifth day of the Simbang Gabi, or in Spanish, the Misa de Gallo, a series of nine Catholic masses leading up to Christmas. Held from the 15th to the 23rd of December in various churches around Singapore, it is one of the mainstays of the Filipino Christmas season. Following the last Simbang Gabi mass, people celebrate the coming of Christmas with a midnight feast, known as the Noche Buena. Celebrations then continue into the New Year. It is the most important holiday for Filipinos, and the longest Christmas season in Asia. Typically held at 4am in the Philippines, the masses are said to have originated in the 18th century, when Spanish friars conducted them for farmers who had to go into the fields early in the morning. They symbolise the anticipation of the birth of Jesus and honour the Virgin Mary, and there is even a belief that if one attends all nine, God will answer their prayers. I catch glimpses of this hope, when individuals stay after the services for a few minutes in bowed silence, or when they go up to the statues of the saints, touching them in reverence. 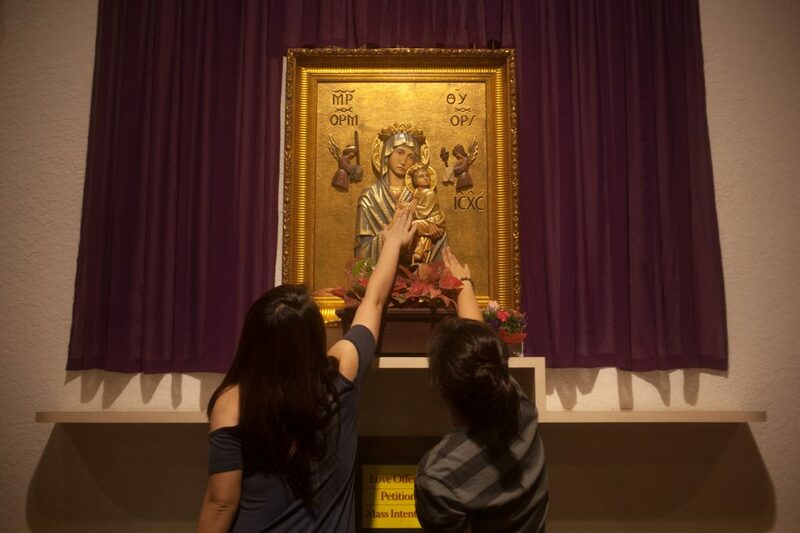 After service, some members stop to pray to a likeness of Mother Mary. 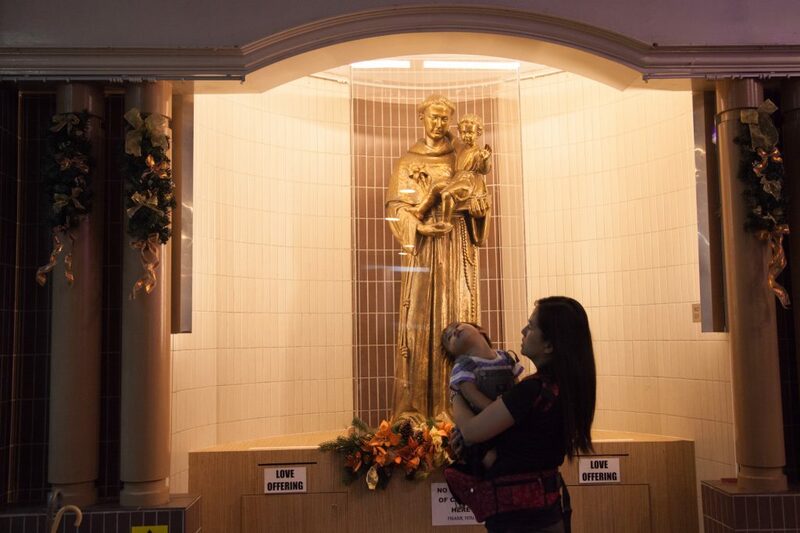 A woman with her child in front of St Anthony of Padua. 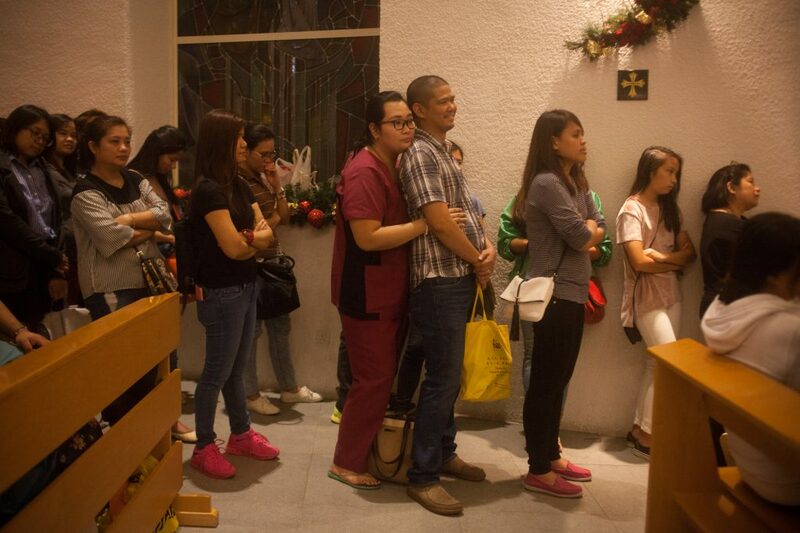 Many professionals come to attend Simbang Gabi after work. 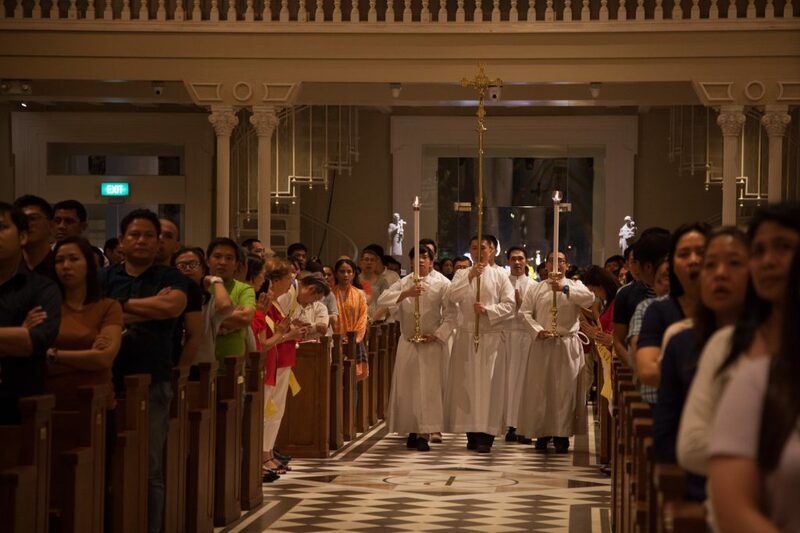 Forming the largest foreign Catholic community in Singapore, Filipinos have contributed significantly to the growth in the number of Catholics here, with churches starting Tagalog services and Filipino ministries to cater to them. The Church also has a Filipino migrant chaplain in the form of Rev Fr Charlie Oasan, to listen to and pray for the community’s needs. 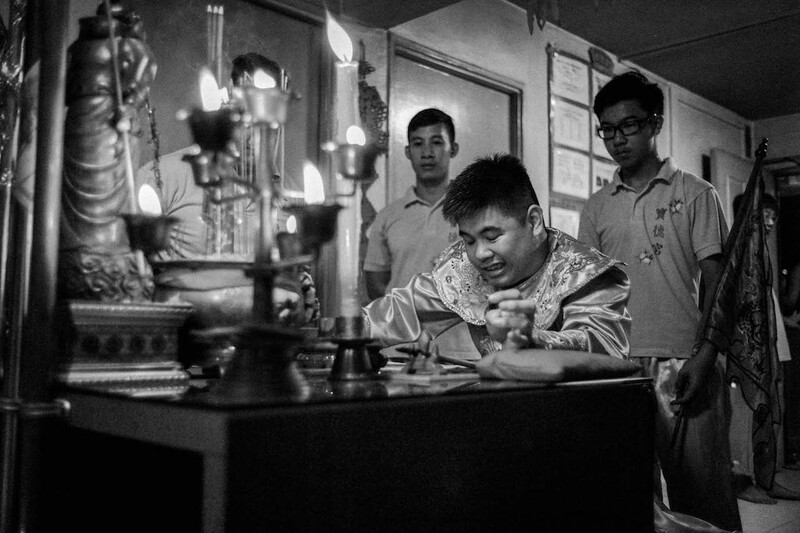 Rizaldy Sapiera is the main co-ordinator of the Simbang Gabi celebrations this year. He has lived in Singapore for 23 years, together with his wife, Marie, and their four children, two of whom were born in Singapore. He says the Simbang Gabi masses started about 12 to 13 years ago. “At first it was a few hundred, in different churches, then each year there’s improvement,” he notes. 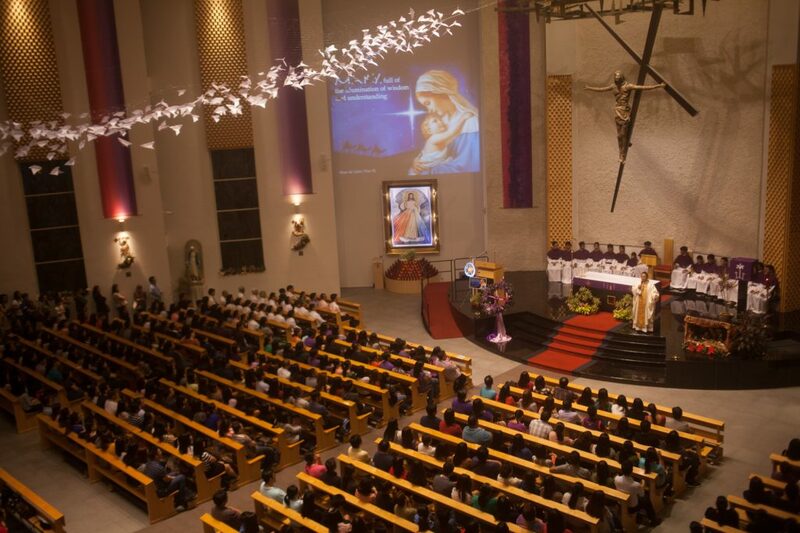 The Church of the Divine Mercy alone sees 2000 attendees every night of the Simbang Gabi. It is here that I meet a domestic helper named Cheribel Dela Cruz. While talking about her family in The Philippines, she burst into tears. “[I want] to kiss them, hug them… you know what my goal is next year?” She says before composing herself. Cheribel Dela Cruz, originally from San Juan La Union. Her employers are Filipino, and are supportive of her being a choir at the Church of the Divine. Maria Lourdes De Chavez Jordan, who has been in Singapore since 2000. Her employers are Filipino. 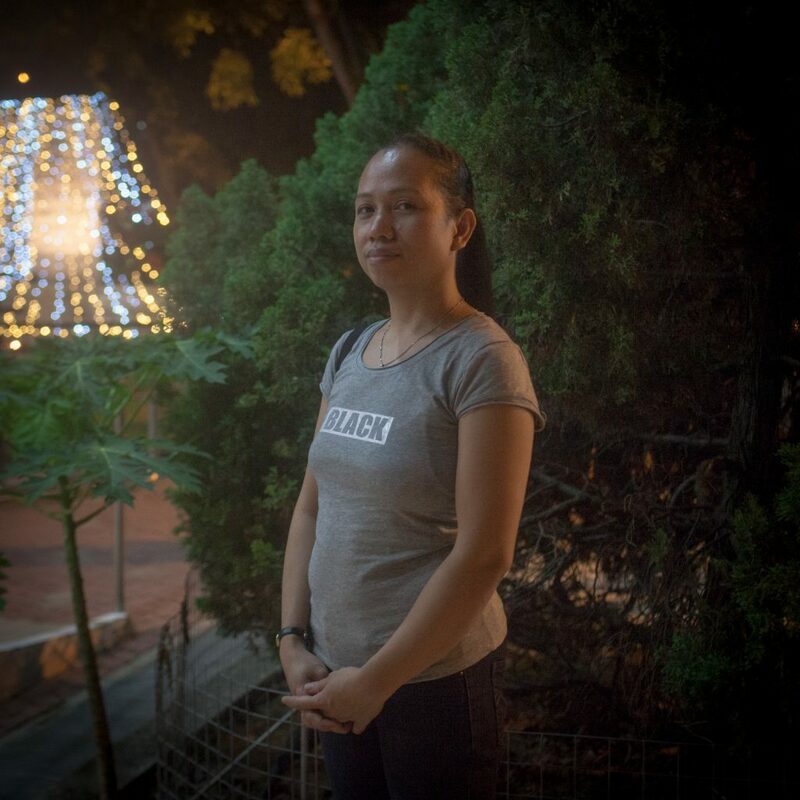 Cheribel is one of the few domestic helpers I meet in my five days photographing the Simbang Gabi. Out of the 167,000 Filipinos living in Singapore, according to the BBC in 2013, there are around 80,000 who work as domestic helpers. Domestic helpers are entitled to one rest day a week, usually on a Sunday, but many employers impose a curfew that cuts their rest day short, before the Simbang Gabi masses start at 8pm. 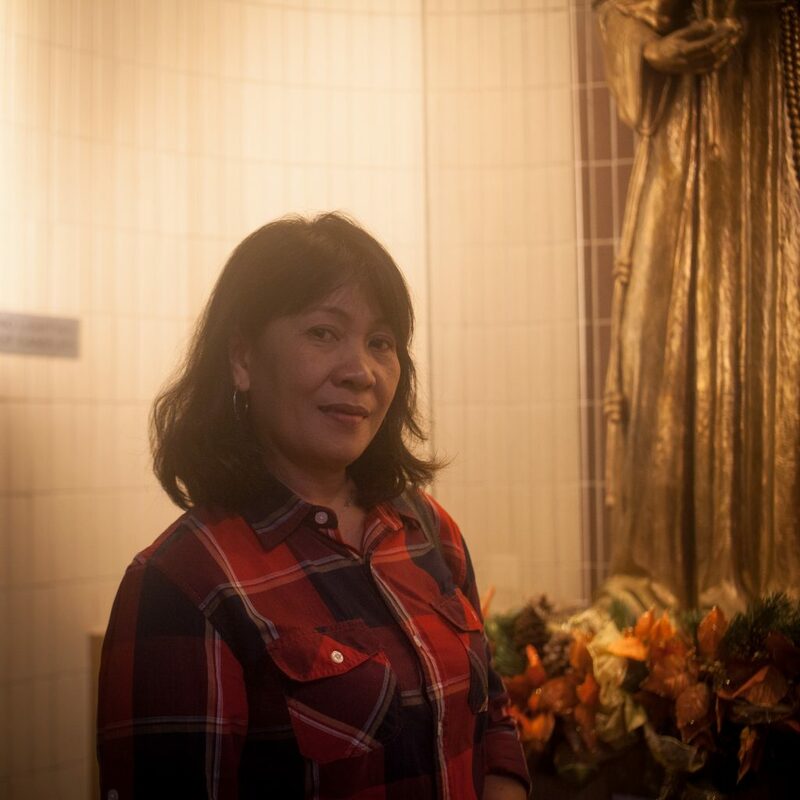 One of the Simbang Gabi co-ordinators, Maria Teresa Tolentino, explained that Rev Fr Charlie had recognised this, and issued a letter from the church asking employers to let their helpers have the evening off to attend mass. “I AM APPEALING TO YOU TO PLEASE ALLOW YOUR DOMESTIC HELPER TO ATTEND,” the letter reads, words bolded and capitalised. “If the employer is from another nationality, the chances are slim, unless they are serving in the church,” says Rizaldy. This seems true for the domestic helpers I interviewed, none of whom had local employers who were not part of the church. 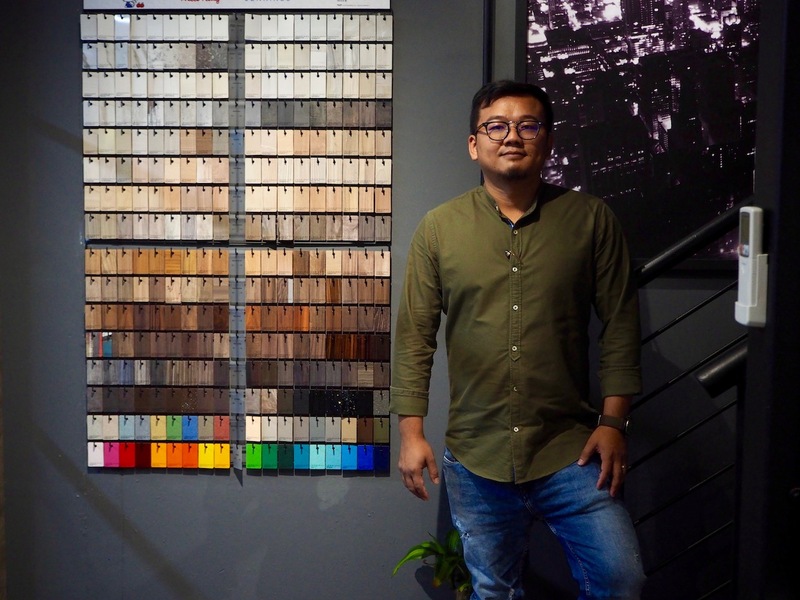 Marteza Navarra, originally from Quezon City, has spent 10 months in Singapore, working for a Filipino employer. 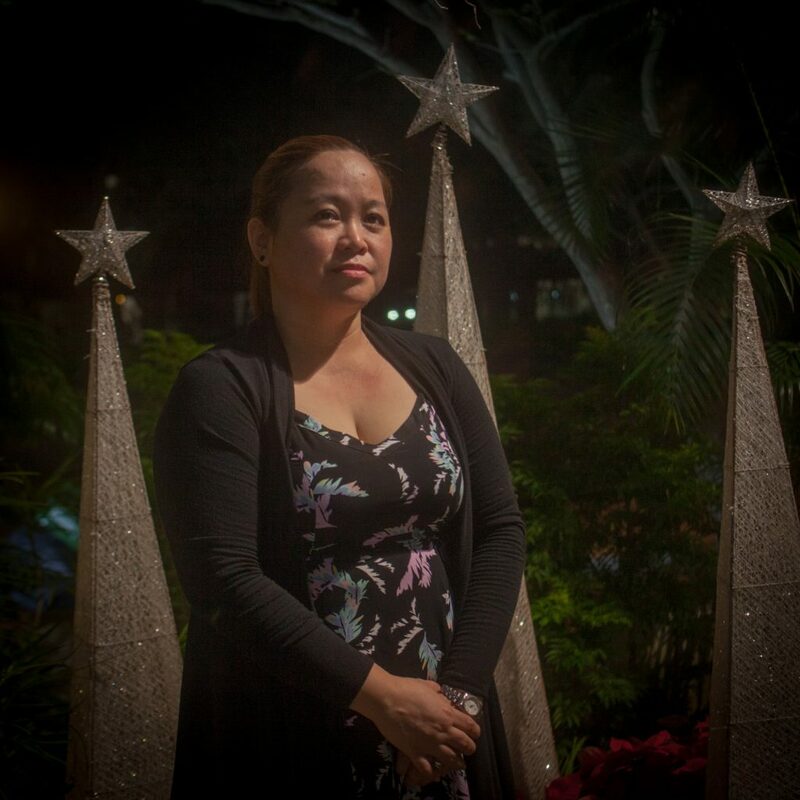 With four children in the Philippines, it’s her first time overseas, and her first Christmas without them. Vinia America. Her employers are local and attend the same church. That day, the boy she looks after served in the service as an altar boy. The daily tasks of a domestic helper also mean that applying for leave to go back to the Philippines during Christmas is a challenging request. “I take care of a kid. Four years old. How to go back?” says Maria Lourdes De Chavez Jordan, who has been in Singapore since 2000. 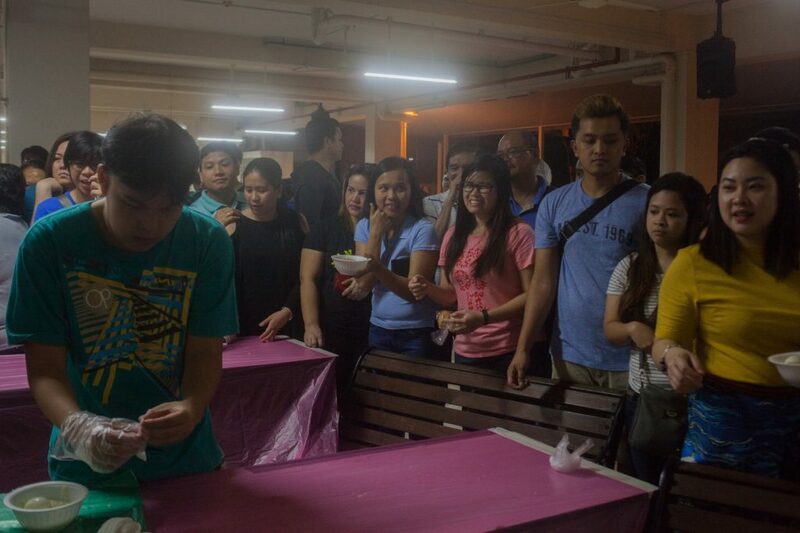 Once the service is over, it is time to head for fellowship, where volunteers serve dishes such as lugaw, a traditional chicken porridge, chicken adobo, and desserts like sapin sapin. The volunteers often spend the entire day cooking for the community. “This place is community,” says Cheribel. In the midst of the joyful atmosphere, there are reminders of how the treatment of Filipinos need to improve. Among the attendees are a group of around six former domestic workers who are living in a safehouse while undergoing labour cases with their employers. 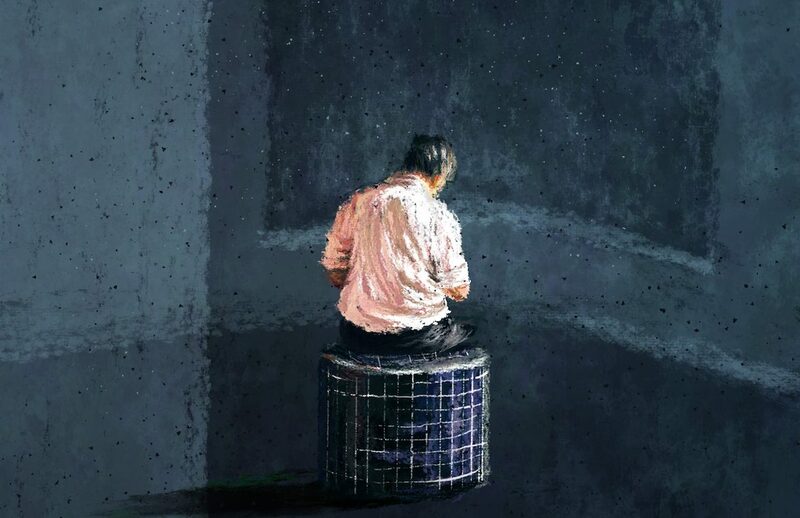 All of them had left their employers’ homes, citing varying situations of mistreatment. 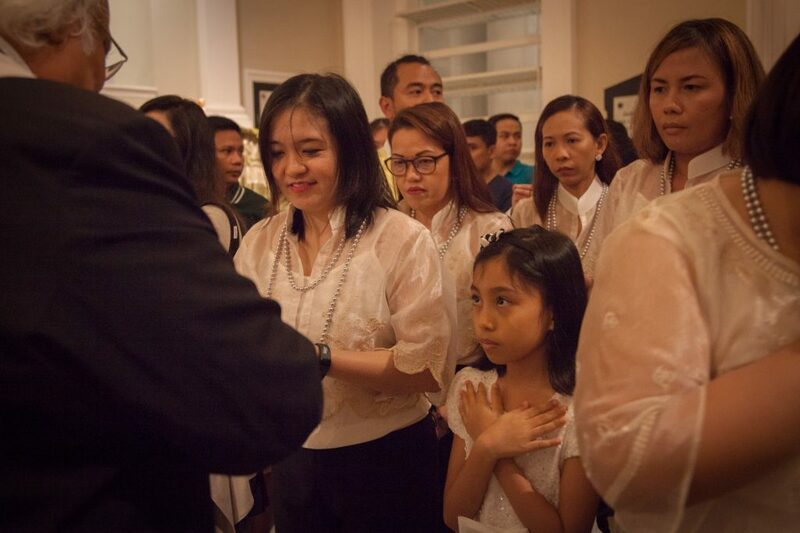 Accompanied by the Philippine embassy, they have been attending each Simbang Gabi mass. 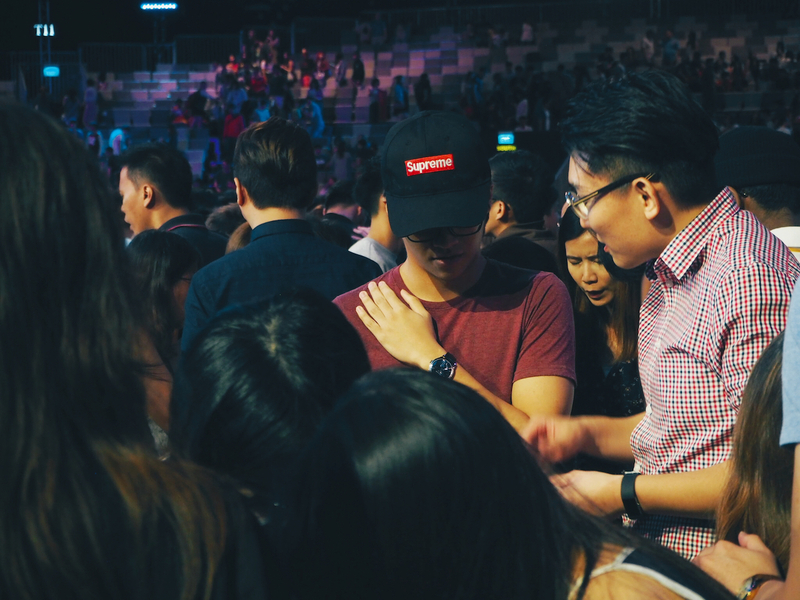 Near the end of each service, they are called to the altar. The father and the attendees then pray for their wellbeing and for them to find strength in God, before presenting them with gifts from the church. Seeing them made me think about my childhood, during which I was primarily cared for by my Filipino helper, Sofia. I don’t recall ever discussing her Christmas celebrations here, and it was not until I was researching this story that I came across the Simbang Gabi masses. It struck me that I never thought to even think about how she might have felt during this season. 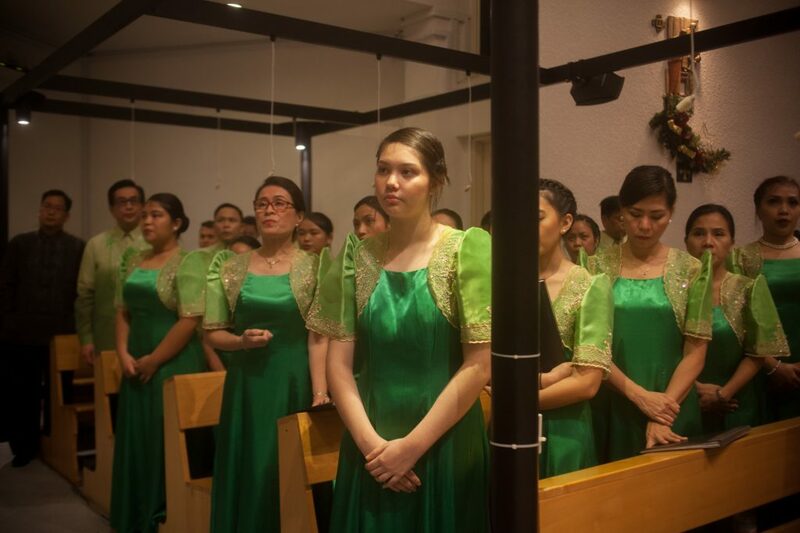 Members of the choir, dressed in gowns with elements of the Baro't Saya, thetraditional Filipino attire for women, wait for their turn to sing at the Church of the Divine Mercy. One of the highlights of the Simbang Gabi services is the fellowship that comes after. Many churches have volunteers who spend the day cooking traditional Filipino food for their members. On a deeper level, I realise it is this sort of ignorance and privilege that form the roots of inequality and disrespect. Made manifest, their worst outcomes are cases of ill-treatment and abuse. This year alone, there have been at least four published cases of physical abuse, from starving to violent beating. In Rev Fr Charlie’s plea to employers, he asks for empathy. But it is also an invitation to bridge a gap between experiences. Even if we cannot identify with the religion or the culture, surely we know what it is like to be respected, regardless of our jobs. Domestic helpers spend a vast amount of time adapting themselves to Singapore’s norms, leaving behind their own families to care for ours. It is not much to ask, especially in the spirit of the season, to allow them time to celebrate occasions central to their culture and identity.